Place a box step at the end of a floating dock to minimize wear and tear. 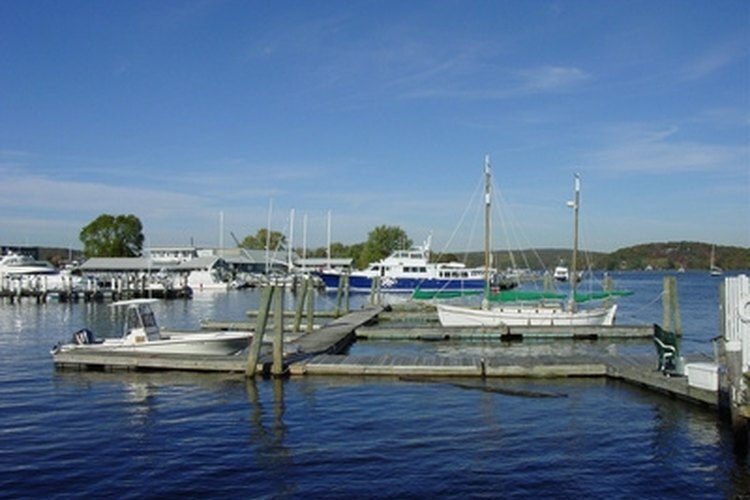 Boat docks are often built to float with the rise and fall of the water level. When constructing steps for a floating dock, it is often desirable to build a separate box step set up that is not actually attached to the dock itself. This box step allows the dock to freely float as it was designed to do without causing the steps themselves to be continually slammed around by the movement of the dock. A dock that is 24 inches high can have a simple three step deck made that will be six inches below the top of the dock at the high water level to allow for this movement. Measure and cut the treated lumber to the following lengths to make a three step deck with 6 inch risers, 8 inch treads and a width of 36 inches. Place a 24 inch long two-by-six on it's side. Place a 16 inch long two-by-six next to it, butted up on one end so there is a place for the 8-inch tread. Secure them together with screws and 3 joist hangers, one on each end and the last one in the middle. Place the 8 inch long two-by-six on top of the 16 inch one, again butted on the same end with another place for the 8-inch tread. Secure with them together with the 1 1/2 inch screws and 2 joist hangars on each end. Make the other side of the box step frame the same way, only as a mirror image so the joist hangars on each side frame will face the middle of the steps. Place the two assembled box sides up with the 24 inch lengths on the ground as the base and equidistant apart at 36 inches. Place the 3 one-by-eight treads onto the frame and secure them in place with 2 1/2 inch screws, at least 3 screws on each end, driving them down into the two-by-six frames. Place one 36 inch two-by-six front riser plate in place on the front of the bottom step riser and secure it in place with more screws. Place the other two 36 inch long two-by-sixes on the back of the box step, one on the top and the other in the middle with a six inch gap on the bottom and screw them into place. Leave the top of the box step below the level of the deck at its high water mark to make the deck more effective as the water level rises and falls. Use caution when using the saw and always wear protective gear for your hands and eyes.